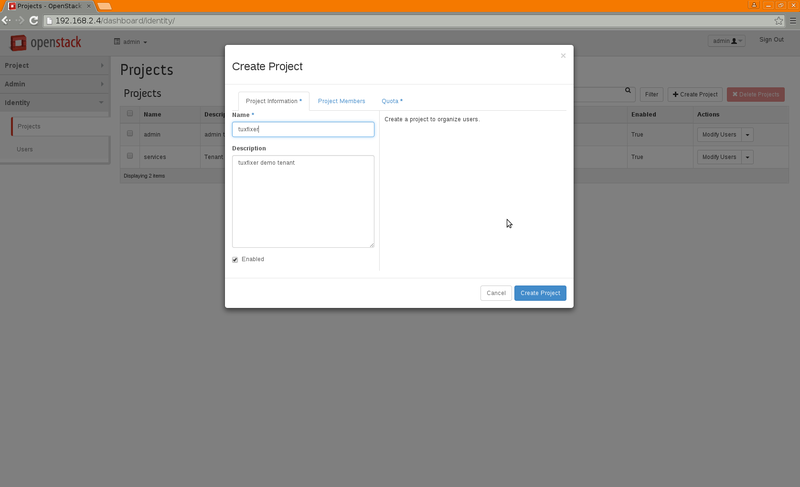 In this tutorial we will show you, how to create project tenant in OpenStack Juno and launch instances accessible from external public network. 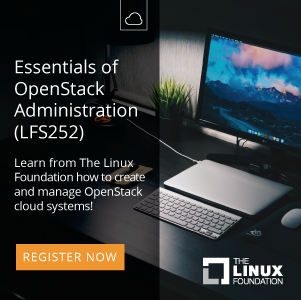 Note: this tutorial is a continuation of OpenStack Installation on CentOS7 / RHEL7 and we assume that you already have working installation of OpenStack. 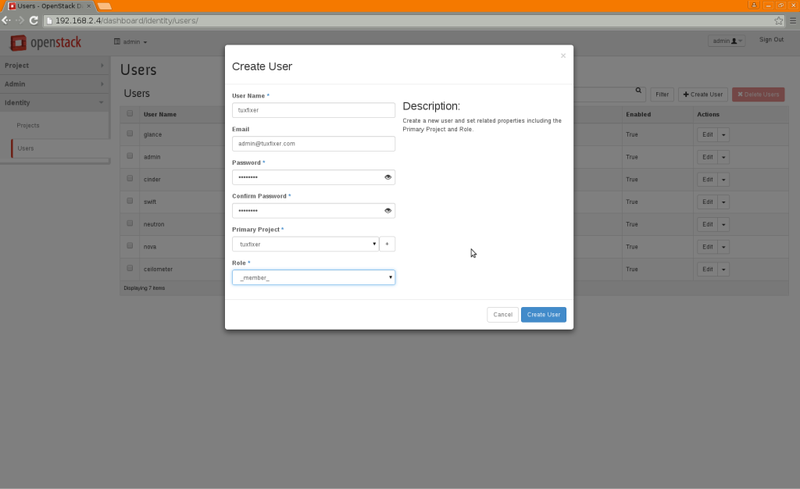 You can now log out from admin account, for typical tenant maintenance tasks we will use regular account (tuxfixer). Login to dashboard as tuxfixer. Log out as admin and log in as tuxfixer. 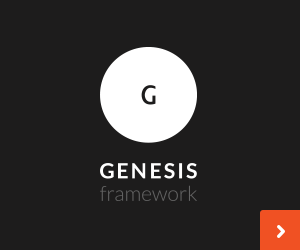 Note: Status of the newly created interface initially appears as DOWN, but it should become ACTIVE, when we refresh dashboard after a couple of seconds. Flavors are virtual hardware profiles/templates used for instances (virtual machines) creation in OpenStack. 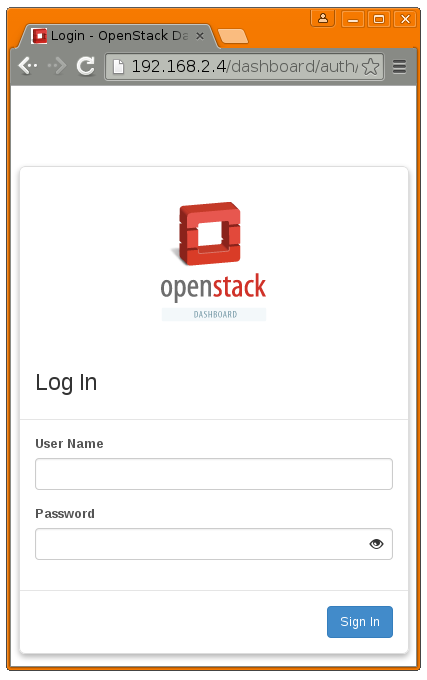 OpenStack comes with couple of predefined flavors for use with newly created instances. In this tutorial we will use one of the existing flavors, if you feel that these don’t meet hardware requirements for your future instances, click on Create Flavor button and create additional flavors suitable for you. 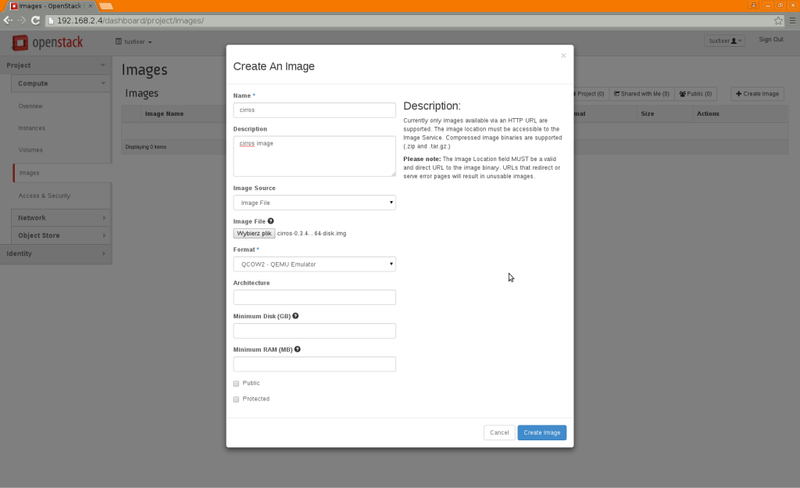 We will use Cirros Image, which is perfect for cloud testing due to its small size. Current Cirros Image (cirros-0.3.4-x86_64-disk.img) available at: http://download.cirros-cloud.net. 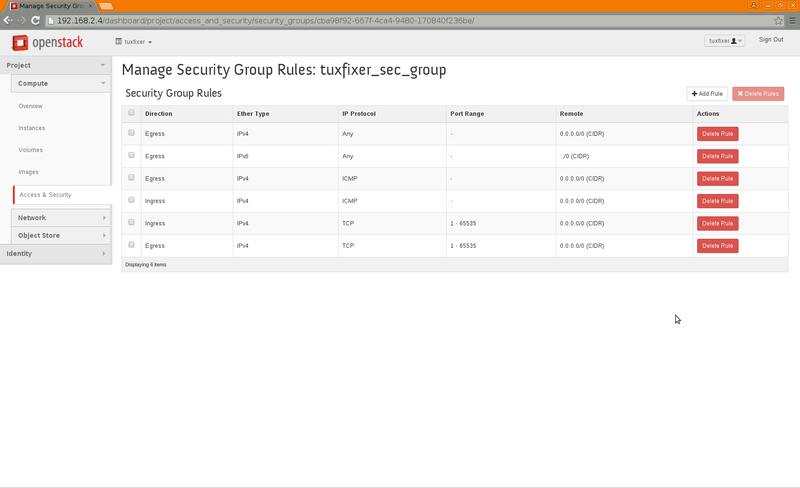 Security Groups control network access to / from instances inside the tenant. Let’s create new security group and add security rules to the group. 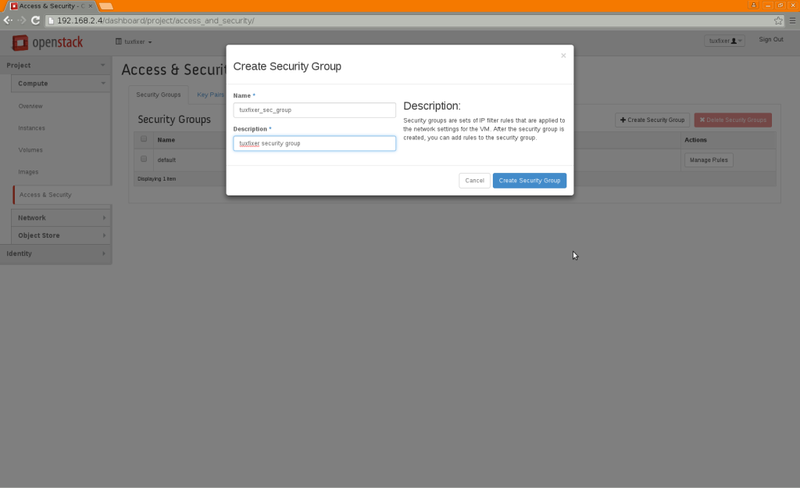 Go to: Project -> Compute -> Access & Security -> Create Security Group. Floating IPs allow access to Instances from public network and WAN. 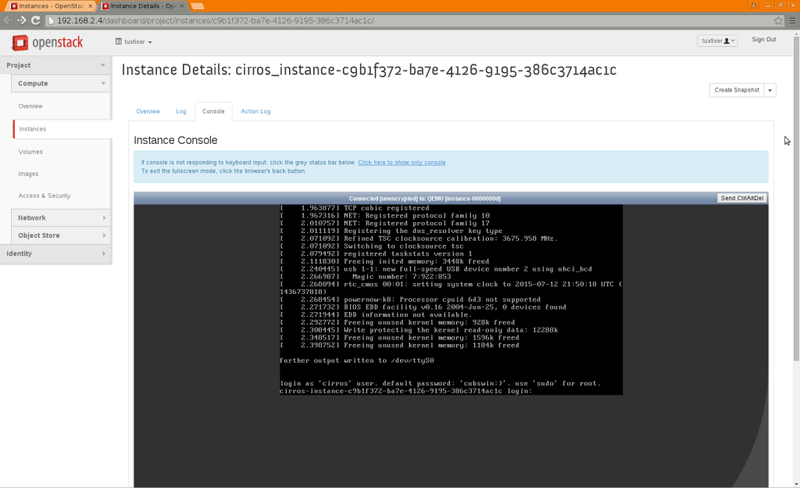 Now when we have all the need components, we can create Instances (virtual machines running inside cloud). Note: Process of creating Instances may take couple of minutes. 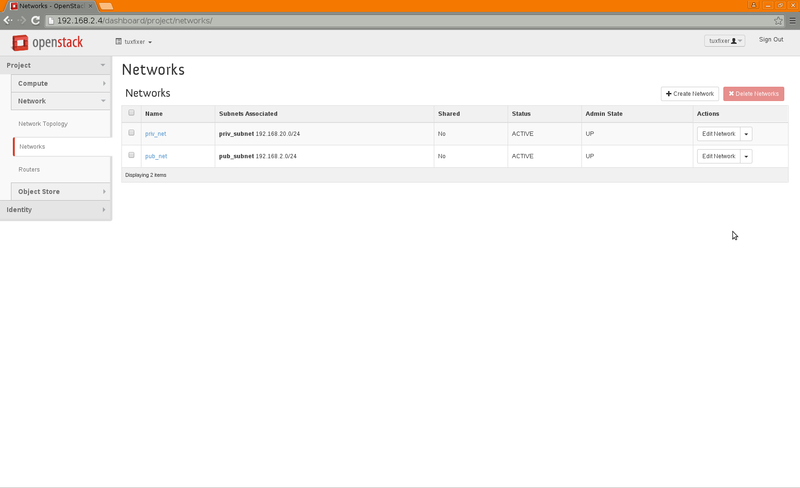 Now when we have running instances and floating IPs assigned to the project, we can assign them to particular instances to let them communicate with public network. 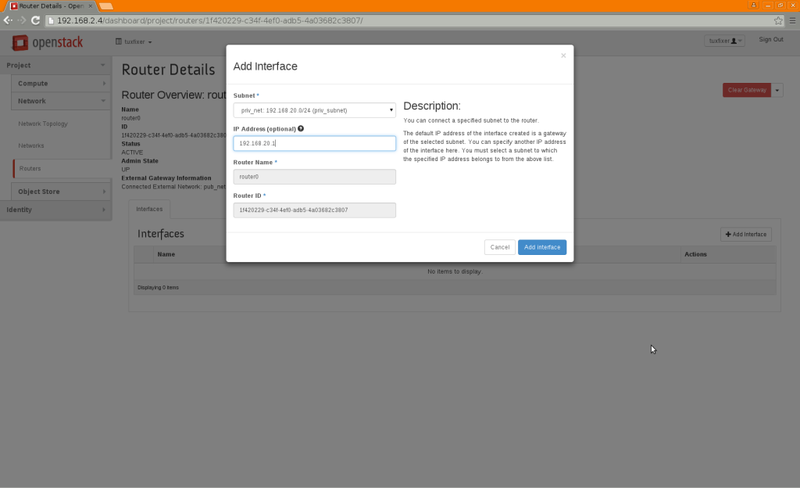 For each instance in Actions column choose Associate Floating IP from drop down menu. 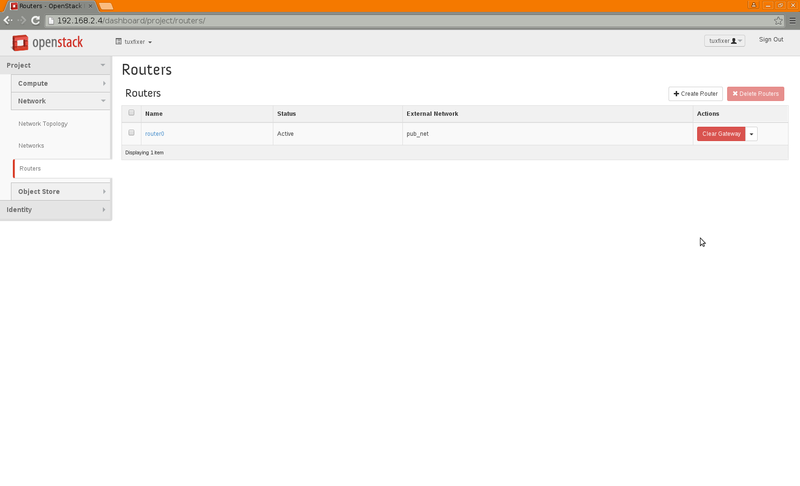 You can access instance console by clicking on Instance Name, then on Console tab. 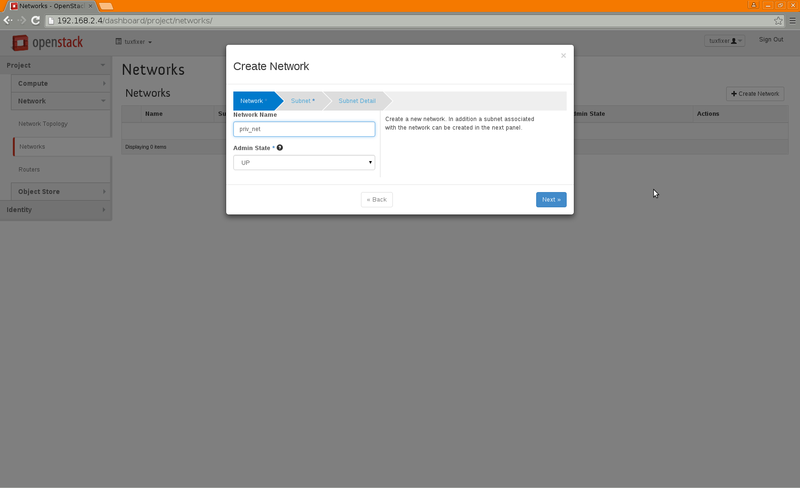 Test connectivity of instances from public network, you can connect from controller or compute node to instance via ssh. PING 192.168.2.6 (192.168.2.6) 56(84) bytes of data. The authenticity of host '192.168.2.6 (192.168.2.6)' can't be established. RSA key fingerprint is ce:44:d8:7b:0d:a2:30:8c:a0:c7:76:43:d4:d7:5c:d7. Warning: Permanently added '192.168.2.6' (RSA) to the list of known hosts. The authenticity of host '192.168.2.7 (192.168.2.7)' can't be established. RSA key fingerprint is 5f:33:88:7d:61:60:e2:25:d2:7a:ad:40:2d:e4:d9:87. Warning: Permanently added '192.168.2.7' (RSA) to the list of known hosts. 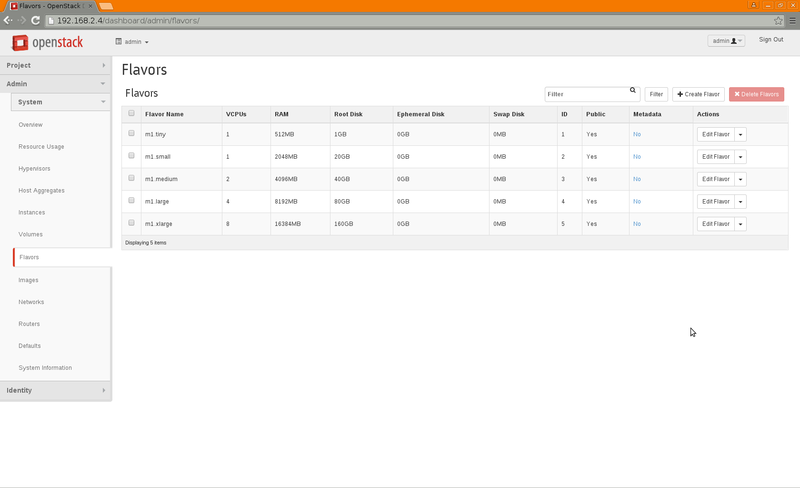 Our project tenant is now configured and instances ready to work. Is it possible to configure the router in order to use DHCP to assign “leased” IP addresses to the instances ? Assuming that by “leased IP” you meant “Floating IP” it is possible of course. You just need to have working DHCP server in your public/provider network (the network where tenant router has gateway interface connected to). Please note that tenant router can only provide DHCP for internal noetwork IPs, so if You want to assign Floating IPs via DHCP, then your public network router has to provide it. Thx for your quick update. 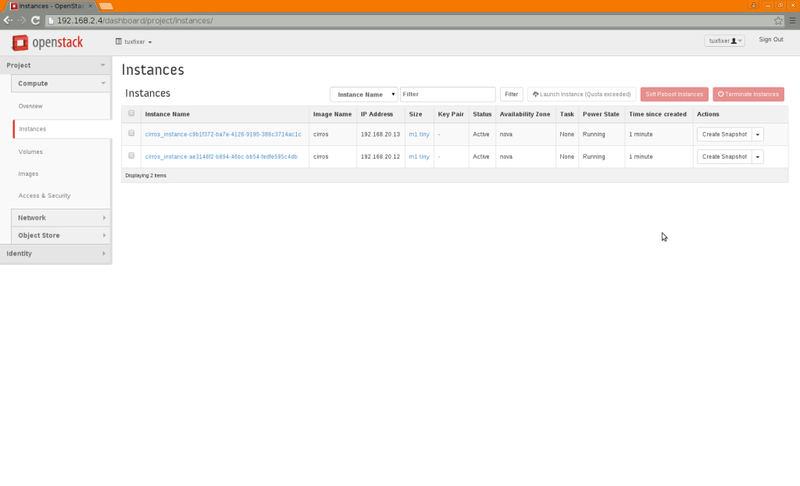 BTW , nslookup works fine on the compute node hosting these instances. Any hint to fix this issue ? I’m using external DHCP server. Do you have DNS servers defined on Instances? Everything is okay thank you ! I assignment is failing, hence VM’s are not reachable. I can see following information in console-log. Unable to obtain IPv4 DHCP address eth0. My guess is that Instance is not getting IP address because something is wrong with OpenStack Neutron DHCP service. But no one of them is pingable. Floating IP allocated OK.
How to solve it? Please advise. Should i add some route? I have no idea what is going on in your installation, but troubleshooting of SDNs inside OpenStack can be pretty problematic. If you see that traffic is dropped somewhere then I would start analysing with tcpdump/wireshark the interfaces one by one in your installation. 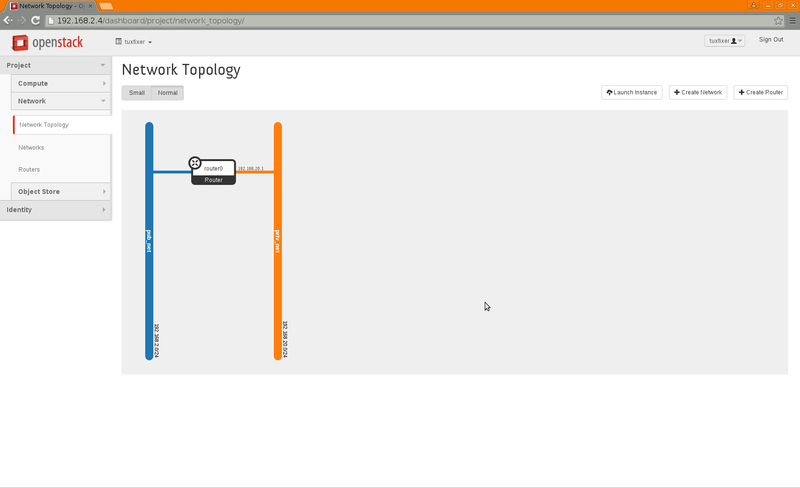 Start from instance’s interfaces like qvo, qbr,tap and then go deeper and check each interface where traffic is dropped. Thanks ..works perfectly for me. I am trying to configure the Mirantis Fuel 11 for OpenStack deployment. 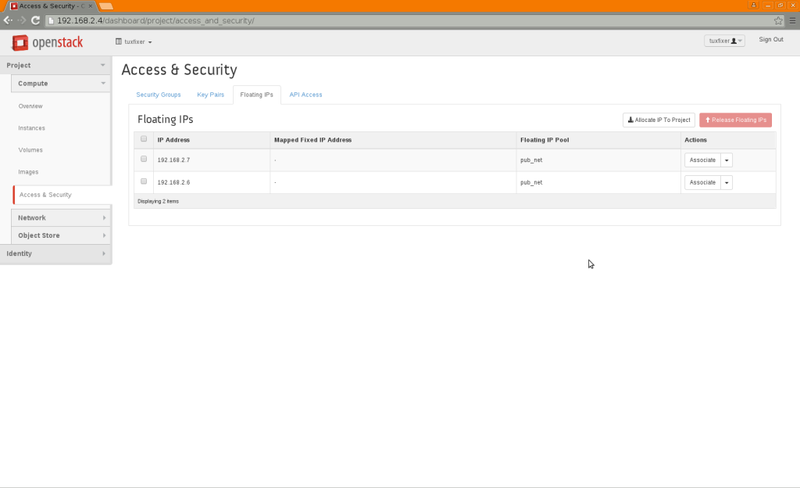 On my Test Server I have installed the ProxMox on that I have created Fuel 11 Master VM and 1 Compute ,1 controller ,1 Cinder. But I am getting error when I have tried to test Network verification. Can you assist me for this. I think you should contact Mirantis technical support.